When organizations look to streamline datacenter operations, they often discover that acquiring, managing, and maintaining storage can make up nearly 20% of the IT budget. Recognizing the opportunity to reduce that cost, Dell has built a game-changing portfolio of solutions that enable enterprises to better manage data growth, reduce storage costs, and simplify the management of their IT infrastructure. Those solutions are built on the Fluid Data architecture, which automates and optimized business growth and delivers the efficiency, agility and resiliency enterprises need to adapt to an ever-changing business environment. See how several customers, including Dell IT, have leveraged this portfolio to transform their datacenter. Balancing performance and cost are critical to a successful VDI project. A key component in this effort is architecting an efficient storage infrastructure, which can help reduce storage capacity requirements and simplify provisioning and management. This webinar will highlight recent advances and best practices in optimizing the storage infrastructure specifically for VDI environments. - What is private cloud computing? - What are the specific technologies needed to support the private cloud? - How do I identify key storage architecture attributes to optimize VMware environments? - How can I evolve my current infrastructure toward a private cloud model? - How does virtualized shared storage enable private cloud computing? Many IT managers are looking to separate hype from reality when it comes to cloud computing strategy. Often times expert advice for getting to the cloud can be miles above the real-world reality. Follow alongside an expert from Dell Compellent as he outlines the four Fluid Data technologies that will help you optimize your Microsoft environment and expand your virtual architecture towards the cloud. Kingman Tang, SNIA; Nathan McBride, IT AMAG Pharmaceuticals; Ajay Chandramouly, IT@Intel; Kipp Bertke, Ohio Dept of Dev. Dis. Kingman Tang of the SNIA Cloud Storage Initiative will moderate a panel of end-users discussing their experiences with cloud storage. The panel will open with five minutes of data based on a recent research report looking at adoption trends amongst IT shops. It will then dive into a lively panel discussion focused on overcoming barriers to adoption and looking at key considerations for companies weighing pros and cons of the cloud. Audience questions are welcome so invite your team and bring your toughest questions. Compellent has long been recognized for its best-in-class data movement capabilities. 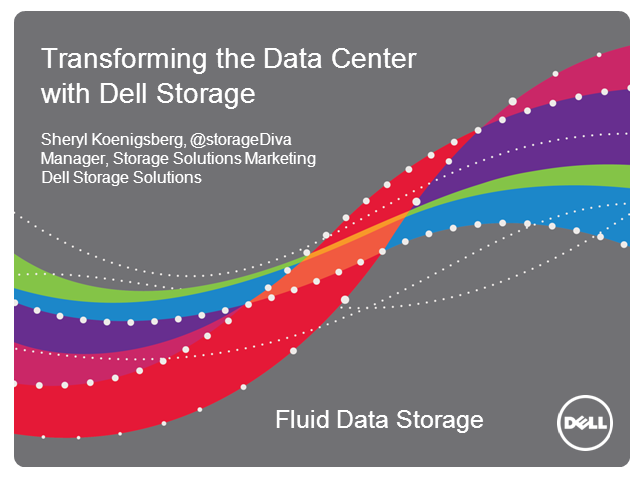 Fluid Data technology moves data within the volume, among different disks and RAID types and between storage arrays. In this demo, Senior Virtualization Product Specialist Josh Raw demonstrates Live Volume, the next generation of the Compellent data movement engine. Learn how Live Volume frees organizations to share volumes between data centers, a key enabler for virtualization and IT clouds. Watch the Dell Compellent Storage Center Demo to learn how we can support the growth and continuity of your business. Our innovative Storage Center offers automated tiered storage, perpetual licensing, and scales on a single platform that will grow with your business. Learn how to manage your data more efficiently while protecting your data against downtown and disaster. The Storage Center SAN is a smart, virtual storage platform that speeds storage provisioning for virtual machines, minimizes disk capacity, automates disaster recovery, fine-tunes data placement for virtual applications and provides a shared storage pool available to all VMs all the time. Watch this webcast to see why Dell Compellent storage is the perfect complement to VMware server environments. Dell delivers an all-in-one enterprise storage array that always puts the right data in the right place at the right time –automatically and continually. By always, we mean in real-time, again and again, automatically placing, storing, optimizing, protecting and dynamically adapting based on granular block-level intelligence and automated data movement. Our Fluid Data technology anticipates how your business will change and dynamically adjusts to optimize the price, performance and protection your organization needs.